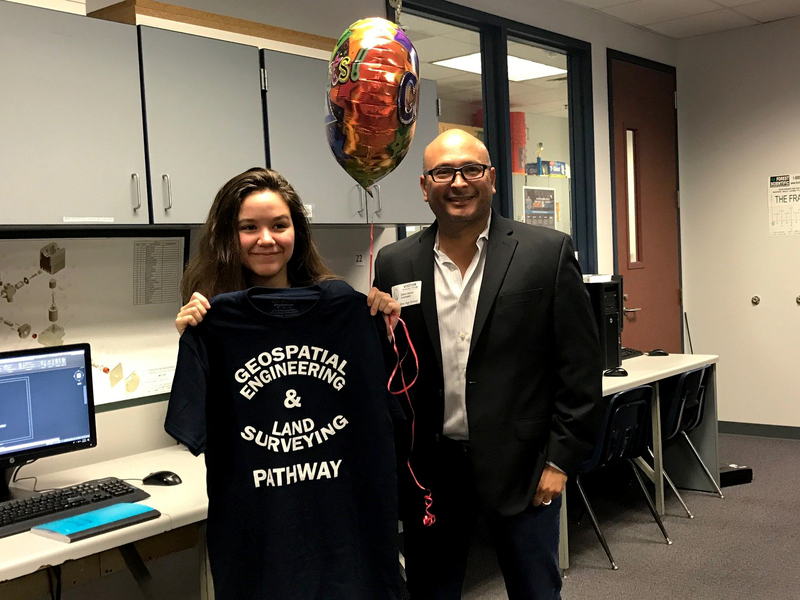 Klein Collins student Alexandra VonHaven and S&V Surveying Vice President and business partner, Isidro Garza celebrate the inaugural Geospatial Engineering and Land Surveying pathway. On a cool fall Friday in Klein ISD, four high school students were greeted with cheers, balloons and presents as they were celebrated for being the first four students the Geospatial Engineering & Land Surveying pathway. One of the newest pathways offered to Klein ISD students, Geospatial Engineering & Land Surveying provides an opportunity to explore a career path while earning college credits in high school. Students will be taught by high school teachers and industry experts, thanks to a partnership with S&V Surveying. Taking advantage of these dual-credit courses not only saves families money through reduced college costs, but they can also rest assured the likelihood of obtaining a job immediately after graduation is certain. Dr. Jeffress agrees, “We have seen an explosion of unfulfilled careers in the geospatial sciences, which Klein ISD is allowing students to have access to these well-paid careers and business opportunities.” Students can also look forward to earning a beginning salary ranging from $43,000 for a GIS analyst to $70,000 for land surveyors. Current 8th and 9th-grade students will have the opportunity to enroll in the Geospatial Engineering & Land Surveying pathway in January as eighth graders choose high school pathways for the 2019-2020 school year. However, there are a few prerequisites. For more information about the Geospatial Engineering & Land Surveying pathway in Klein ISD, visit www.promise2purpose.net. You can also have any of your questions about the program answered by submitting them through the website.